Although it’s only early August there’s been more than a sniff of, dare I say it, Autumn in the air. I love this time of year. It always makes me want to start new things and get more creative. It’s also the ideal opportunity for a good list. I do love a good list (or even a bad list). Sarah wrote eloquently about her use of lists to help her manage things and here of her list of Autumn Loves. Shall we see how I’ve been progressing? There’s been some flexibility in the list. I have actually completed some things, completely forgotten about others and added in some new ones. 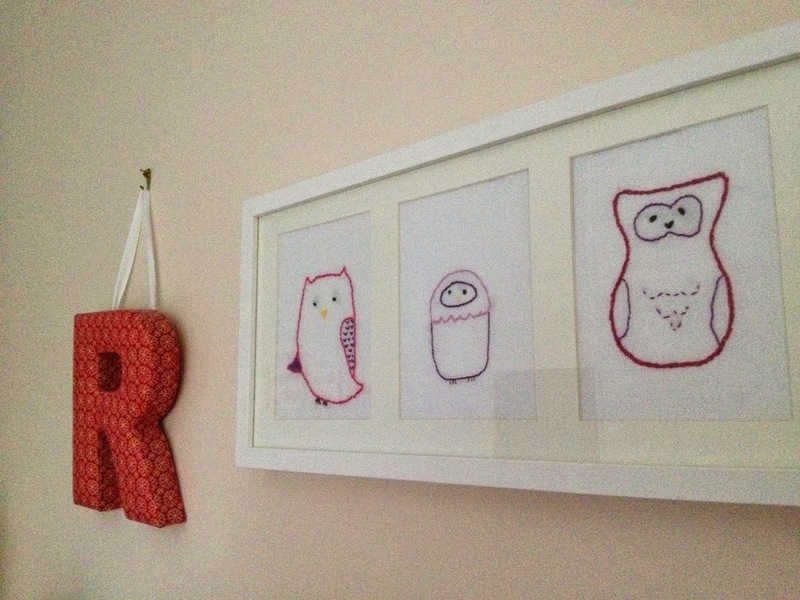 :: I did embroider (and frame, twice after a small accident! Maybe I should rename myself Little Miss Whoops?) a panel of 3 owls for LittleRs room. They complement the Matryoshka dolls I did for BigR. Every time I change her nappy she shouts “owls”. It’s very satisfying. :: I went on a Betty’s cookery course. I did this in November and loved it once again. I’ve made the recipes from that day a few times again since. We particularly enjoy the lamb meatballs and the sausage cassoulet. I’ve actually got another voucher (more birthday delights) to use so am busily looking at the website to see what I fancy doing! :: This wasn’t on the original list but added to it after a trip to the knitting and stitching show in November. I knitted and completed the dog of doom…actually, on reflection, it wasn’t that bad but next time I’ll sew it up as I go to give me encouragement. Little R actually loves it so even though it’s not perfect (I ‘forgot’ to add the tail. It was a bit stubby and short and once stuffed looked a bit rude) it was a job well done. Big R was going to get a similar dog but changed her mind for a ballet cardigan which my friend, S, knitted up for me so she might actually get to wear it before it was too small!! :: BigRs applique blanket. I have all the necessary materials including the elusive (in Leeds anyway) bondaweb and a very inexpensive fleece blanket from Ikea in purple (the current colour of choice, unless it suddenly becomes blue to go with the Elsa from Frozen adoration). Now I just need a clear evening and some good TV for the hand sewing! :: Take BigR to paint pottery. Well we did this on our holidays and we’ll being doing it again (at a local pottery studio that’s opened) at the start of September when BigR has her first birthday party (for those other than family!). I’m a little nervous actually as I’m hoping the invitees will come! BigR is taking it in her stride! :: Photobooks – the photos are there but there’s been no start to these yet. Maybe we’ll do it in time for Christmas presents for Grandparents? :: Socks. I learnt to knit in the round earlier this year. Then promptly forgot how to join the circle. Then practiced and remembered. Thanks to YouTube. I’ve taken Christina’s most simple pattern and will be attempting this very soon. :: Embroidery nameplates for the girls’ bedroom doors. We thought it might be nice for the girls to have their names on their doors. I can’t find any ones I think suit both girls well and aren’t ridiculously expensive anywhere so I’m going for the DIY option. I’m trying to decide on fonts but might just go with my handwriting and some decoration pertinent to them. :: Skirts for both of the girls. I’ve seen this pattern via Jennifer’s blog. I’ve got new bobbins for my machine. I’ve new needles for my machine. I’ve material, cotton and elastic. I’ve even measured the girls for sizing. Now all I need is to stop procrastinating. Maybe a job for when the ABO is on the late shift. :: Knitting the hat S bought for me for Christmas! It’s lovely blue and green Aran wool. It’s a very simple pattern and should be fairly quick to do once I get started!! I might even get it finished in time to wear his winter. Maybe I've spoken too soon? :: Learning to crochet. This was a birthday present. I’d hinted that I’d like to learn but wasn’t sure if I’d be lucky enough to get this as a present or if the day would be free. Anyway my friend S and I are off to learn how to at Baa Ram Ewe at the weekend. I’m excited to learn (another) new skill (I hope I can do it!!) and have a day out with my lovely friend. Then I’ll just have to keep the yarn buying in check and find some time to practice! Sooooo…plenty to keep me busy there! Wonder if I’ll have anything finished anytime soon? Of course I’m going to have so much extra time when BigR starts school and LittleR naps eh? I know it will be at this point that LittleR decides to stop napping! I admire all your projects, good stuff. I also enjoy getting stuck into creative things in autumn and winter. It is the time in which I usually write the most.